Official art of Kotake and Koume, from Ocarina of Time. Kotake and Koume (コタケ, Kotake, and コウメ, Koume) are characters from the The Legend of Zelda series. Kotake and Koume are Gerudo twin sisters and adoptive mothers of Ganondorf. 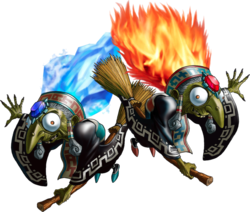 They are witches with elemental powers - Kotake's being ice based, and Koume flame based - and fight Link in Ocarina of Time as the boss of the Spirit Temple. During the first phase of the battle they fight separately, and in the second merge into a single, younger-looking being named Twinrova. They later appeared as a boss in The Legend of Zelda: Oracle of Ages and The Legend of Zelda: Oracle of Seasons in a somewhat similar fashion. Koume and Kotake flying around on their brooms in Gerudo Valley. The twins appear on the Gerudo Valley stage in Super Smash Bros. for Nintendo 3DS. They appear once the bridge has been broken, after which they fly around the stage before randomly setting either the left half of the stage on fire, or creating ice spikes on the right side. This effect is only temporary, and forces all fighters to one side of the map. Koume, the Sorceress of Flame, and Kotake, the Sorceress of Ice. Despite having a combined age of 800, when they fuse together, they turn into the youthful, bewitching beauty Twinrova. This gigantic, powerful from attacks with both fire and ice magic, so watch out! Ken alongside Koume on Gerudo Valley. Koume and Kotake reappear on the Gerudo Valley stage in Ultimate, behaving the same as they did in Super Smash Bros. for Nintendo 3DS. The twins also appear as a spirit as well as their combined form Twinrova. This page was last edited on February 12, 2019, at 16:48.